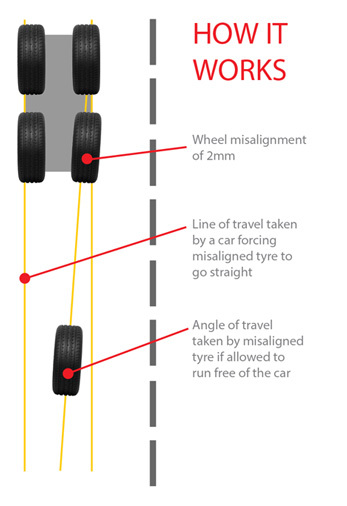 Setting the vehicles suspension and steering geometry gives you the correct handling of the vehicle and optimum tyre wear. As a rule, this should be done every 10,000 miles or at least one a year. Depending on how the vehicle is driven. New or old tyres fitted will make no difference to the alignment readings. They will however have an effect on the way the car feels, even after the alignment has been corrected. This depends on the make and how many adjustments there are on the vehicle. How can I benifit from Wheel alignment? Modifying a vehicle’s ride height may cause changes in alignment geometry that result in improper camber, caster and toe. Changes in tyre and wheel offset can have drastic effects on the scrub radius. WinAlign Tuner instructs your technicians on how to adjust for these factors and provide the best possible solutions for vehicle handling and tyre life.